Kevin Binkert is a machinist, artist and inventor in San Francisco. 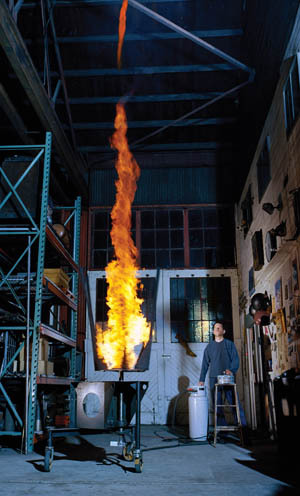 One of his pieces is the Flame Tornado (right), a gorgeous kinetic sculpture that has “played” at the Venice Biennale, among other venues. Kevin is adept at managing flame & heat (you should see how dynamic that tornado is, moving from delicate tendril to violent, fat vortex!). Add that to his fluency with machines and you will not be surprised he is teaching “Helpful Hacks for Home Coffee Roasting” on the Homesteader Stage this Sunday at 12:30pm, sharing how to mod Hamilton Beach air poppers for home coffee roasting. Kevin is also a longtime member/crew/collaborator of the seminal large-scale robotics performance group, Survival Research Laboratories (shorthand = SRL). SRL was founded in 1978 by Mark Pauline and ever since then has attracted an incredible band of talented engineers, carpenters, electricians, software & firmware developers, and artists. SRL continues to stage shows around the world – about once every year or so, and Mark continually builds machines to add to the family. The extended community of SRL continues to manifest in an astonishing range of important Bay Area cultural cornerstones (e.g. The Exploratorium, DorkBot, SFMOMA, Burning Man, the Crucible, ZeroOne, Art and Technology Colloquium, and on and on—someone should make this diagram!). SRL predates the Internet. And has been truly underground. To find out about a show meant you were connected to a physical web of people. To have seen a show you would either have to have been there, or have had to order a videotape through snail mail from Mark himself (or rented one from an alt video store). To join the team you had to navigate getting through the shop gate. All physical connections. Of course over the years the crew adopted a simple list serve to stay in touch. People have married (and divorced), and developed hundreds of projects and businesses. And they continue to come together as SRL—just last week at LAMOCA, for example.